Brand’s future in U.S. market increasingly uncertain. Could FCA be ready to pull the Fiat brand out of the U.S.? There are indications it could happen. When the Fiat brand made its return to the U.S. market after a quarter-century absence it seemed a no-brainer; after all, a weak economy and soaring oil prices had Americans trading in their big sedans and SUVs for small, fuel-efficient products like the Fiat 500. After some initial launch problems that led to the complete shake-up of the brand’s management team, Fiat started to gain traction, sales jumping to nearly 44,000 in 2012 and growing another 5% by 2014, just as the brand began to roll out additional product. But that bubble quickly burst and, last year, Fiat brand sales fell to barely a third of their peak just four years earlier, raising questions about whether it has any staying power in a market that is largely snubbing it. Precisely what is the question, however. Right now, there are four key product lines: the original Fiat 500 hatchback, the 500L microvan, the 500X crossover-utility vehicle, and the two-seat 124 Spider that was developed as part of a joint venture with Mazda. The original hatchback is also offered in all-electric form, parent Fiat Chrysler’s only battery-electric vehicle, the 500e. FCA CEO Mike Manley hasn't offered exactly a ringing endorsement of keeping Fiat in the U.S. But none of those models really touch the right nerve in today’s market – where cheap gas and relatively easy credit have encouraged a shift to larger, more expensive utility vehicles – and that’s not likely to change anytime soon. 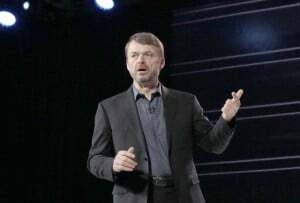 At a strategy session in Milan, Italy, last June, Marchionne outlined for analysts and the media plans for all of the Euro-American automaker’s brands and, if anything, Fiat’s global line-up will continue to shrink as mainstream segment models like the Panda and Punto get chopped and the brand shifts focus to its smallest vehicles. In particular, Marchionne’s plans called for a shift to electrified drivelines that could make the brand even less relevant to U.S. buyers in the near-term. Even with the right product mix, Fiat has other challenges that it hasn’t been able to overcome. Though the 500 led the “City Car” segment, the brand, overall, was rock bottom in the latest J.D. Power Vehicle Dependability Study released last month. The survey, which measures the number of complaints motorists report after three years of ownership, found the typical Fiat suffering from 2.5 times as many “problems” as products from industry leader Toyota, and more than twice as many as the industry average. 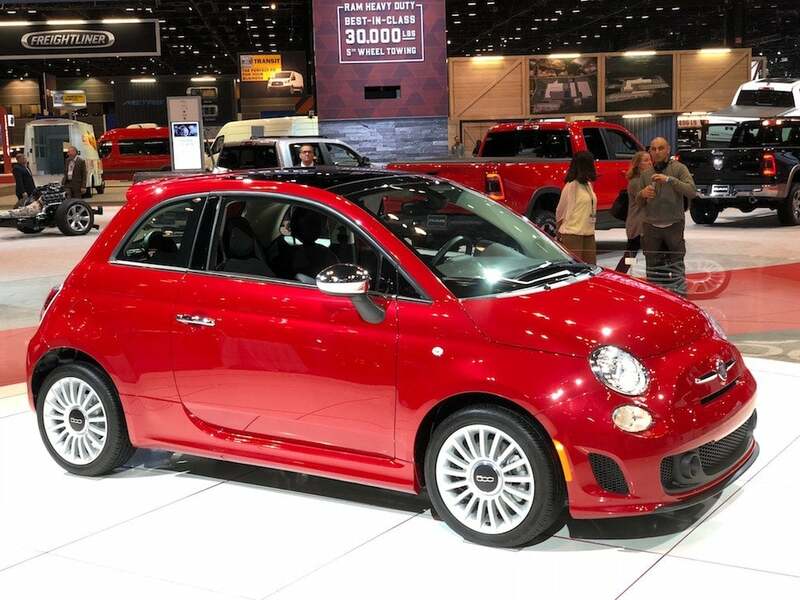 Company officials have struggled to find a way to keep existing buyers coming back to Fiat showrooms but the brand has one of the U.S. industry’s lowest loyalty rates. 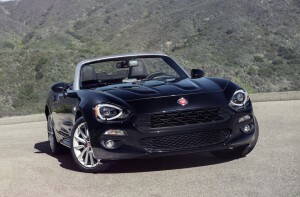 FCA hoped Fiat Spyder 124 will jump start sales for the brand in the U.S.
To some observers, the lack of a direct commitment to retain Fiat’s U.S. presence is telling. Indeed, referencing comments made by Marchionne last year seems to hold out relatively little hope for Fiat’s U.S. presence long-term. If anything, he suggested the real market for the brand will be in Latin America where it has performed at its best. In Europe, its slimmed-down product line will likely mean further reductions in sales. There’s yet another factor that could play into the future for the Fiat brand. On Tuesday, Robert Peugeot, the president of the PSA Group, signaled that the automaker might consider some sort of link-up with FCA, saying “the planets could be aligned.” Whether that would mean a joint venture, alliance or even a merger is uncertain. But, depending on what might happen, it could lead to a complete rethinking of the role that all Fiat Chrysler brands will play going forward. This entry was posted on Tuesday, March 19th, 2019 at and is filed under Automakers, Automobiles, Business, Executives, FCA, Fiat, Markets, Personalities, Sales, Sales, Trends, U.S./North America. You can follow any responses to this entry through the RSS 2.0 feed. Both comments and pings are currently closed. Not sure I entirely agree with Karl Brauer. While it would be favorable to hear that Fiat is not willing to pull out, Chrysler claimed in the late 50′s that DeSoto was going to continue. It was axed in ’61 (I seem to recall). Chrysler has already dismissed Imperial and Plymouth, and Lancia and the current Chrysler don’t appear to be heading toward increased product offerings. I was hopeful that Fiat might catch on with at least Gen Z, that they would tend to disregard their parents favorite rides weighing 5000 lbs while transporting one driver in favor of something that uses less energy to manufacture and less to operate. Maybe too little too late. Any thoughts? After killing the Chrysler 200 and soon the Chrysler 300 too, not much will remain of the Chrysler brand either. Furthermore pickup trucks are no longer sold under Dodge, and the Dodge Dart has been killed, leaving Dodge will a tiny footprint too. An additional point: The Fiat Tipo is sold in Mexico as the Dodge Neon. Is that really a Fiat or a Dodge? The Jeep Renegade is made in Italy from a Fiat 500X platform and sold in America. Is that a Fiat or a Jeep? Why am I pointing these things out? Because it’s clear to me that management is focusing on overall sales of the entire FCA company and not so much on creating a large lineup of vehicles under a particular brand. Management wants to finish off some Chryslers while boosting Jeep. Apparently management is also willing to rebrand vehicles to boost sales even though it decreases the presence of a particular brand, in this case Fiat. FCA is by no means the only brand sharing platforms or shifting models from one brand to another depending upon the market. But it does have a long history of this, selling Chrysler models as Lancias in Europe for a number of years, as an example.